It was a bizarre trifold juxtaposition, even by the standards of bizarrity that mark our Bizarro species. Three different inputs cranked through my consciousness, all in one week. On the one hand, there was my first encounter with the statement on the part of Pope Francis that he was open to both welcoming an encounter with alien beings and potentially baptizing them, should they be up for it. I must have missed it the first time around, but there it was, from the mouth of the Pope. 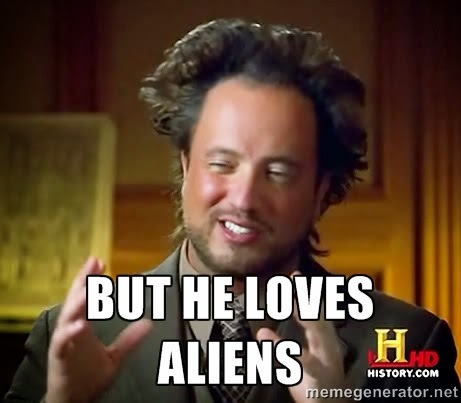 Sure, God loves aliens. "Who am I to close doors," he said. Honestly, if anyone could pull off such an encounter successfully, I think Papa Frankie could. On the other hand, there was the statement by Cambridge cosmologist Stephen Hawking, who in a recent talk reiterated his deep fear that an encounter with alien life would be catastrophic for the human race. Alien contact should be avoided, and humankind should be more careful as it shouts our presence into the void. We must be wary, Stephen Hawking warns, for out there in the deep there may be beings whose intellects are so far beyond our own that they will make us significantly less impressed by Stephen Hawking. Museum, who kinda sorta sides with Hawking on the "don't mess around with the aliens" thing. I know, that's three hands, but bilateral symmetry is such a terrestrial chordate conceit. Ken Ham believes the search for alien life is a waste of time, because, well, the universe is only 6,000 years old and change, and was made only for humans. 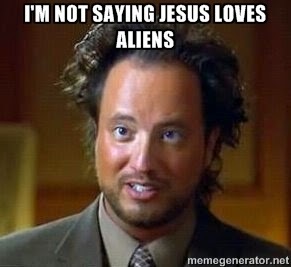 If there are aliens, they're all going to hell anyway, because Jesus only came to save humans. That Ken Ham's "God" would create a universe filled with doomed, hell-bound creatures is perhaps not surprising, given that his theology does that to pretty much all of us human beings, too. So the fundamentalist and the avowedly atheistic cosmologist worry about alien contact. Why? Perhaps because it would shatter the ground of their ethos. Both fundamentalism and atheistic self-understanding are creatures of the modern era. Both place human beings and empirical human forms of self-understanding as foundational. We can grasp everything. We are what matters. Being creatures of high modernity, neither Ken Ham nor Stephen Hawking have room for self-shattering mystery. Neither would hold up well in the face of an encounter with higher forms of being, which would shatter our humanity--and our particular history as a species--as a meaningful basis for a belief system. But a more ancient form of faith, which hails back deep into the preindustrial memory of humankind? The one that's rooted in a long tradition of exploring our encounter with the unknowable Numinous, and yet somehow manages to integrate and embrace science? It sees no threat, and would approach more advanced beings with open arms. Not a surprise, I suppose. If you've come to terms with our encounter with an infinite, omniscient, and omnipotent being that transcends time and space, why would aliens bother you?